OK, too many people are asking, so here it is. 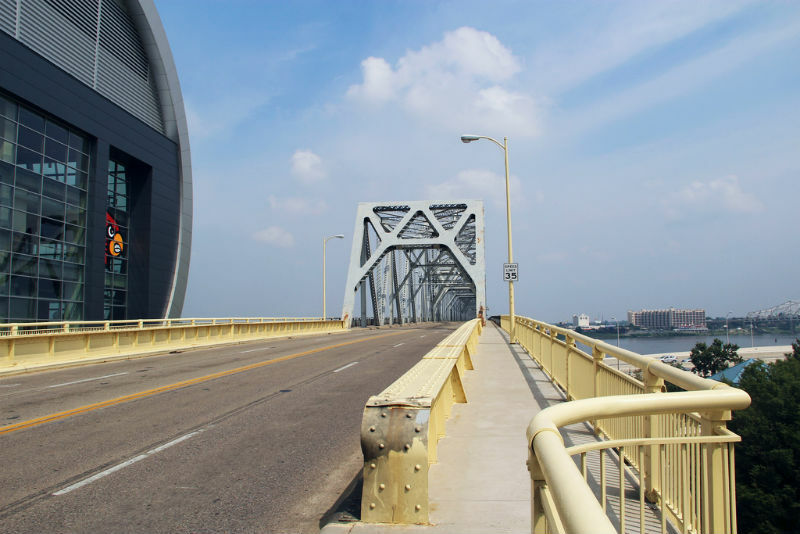 Wednesday I called the two parties responsible for the decision to close the bridge to pedestrians, Walsh Construction & KY Transportation Cabinet (contacts: Max Rowland of Walsh and Andy Barber KYTC Project Manager). Even though the work affecting the bridge is on the Indiana side of the bridge, KYTC is the responsible agency rather than IN Department of Transportation. INDOT is responsible for the east end ORBP bridge, KYTC is responsible for the downtown ORBP bridge. Walsh Construction was contacted because they will have to do the actual work as outlined by KYTC. Contacts were made with media, the mayor’s office, several attorneys, Barry Zalph (founder of Bicycling for Louisville), agencies on both side of the river and others. Thursday morning city engineer Dirk Gowin called, ah, the chronology is wrong, Max called back stating that Walsh simply figures out how to execute and then executes the decisions of KYTC. I assured Max that we understood Walsh’s role and that our contact was one of courtesy to make sure Walsh had adequate ‘heads up’. OK, back to city engineer Dirk and friend of many years. Dirk called with a quick, simple plan that guaranteed pedestrian access across the river/state line. I agreed with him that his was an elegant solution assuring him that we would support his plan. I had not hung up the phone from that call before a KYTC manager called. His was a hard line ‘No. We are closing the bridge to pedestrians… We did not have to accommodate pedestrians in Madison… etc.’ I suggested that perhaps the citizens of Louisville are more determined to hold on to civil rights than are the citizens of Madison, and gave him two assurances: 1 – we are not trying to make trouble, but rather, we are looking for a solution and 2 – we have plans to walk across the bridge several times during the week KYTC has plans to close the same. I asked if he had talked with Dirk recently, ‘No’, then encouraged him to talk with Dirk about his solution. The conversation ended with one party repeating that ‘the bridge will be closed to pedestrians’ and the other party repeating ‘we plan on several crossing by foot beginning on Monday’. Friday, the WAVE3 interview (below) took place with no solution in hand, then within an hour WDRB called to let us know KYTC had just released a statement outlining their change of construction plans permitting an accommodation of pedestrians on the bridge. Moral of the story… talk with your opposition, be open/transparent in the conversation and stand peacefully your ground. Thanks are due to KYTC, Walsh, Dirk, media, Barry, attorneys, other agencies and to the citizens who voiced concern. And they all lived happily ever after. ?? ?